Società Sportiva Calcio Napoli, commonly referred to as Napoli, is a professional Italian football club based in Naples and founded in 1926 (refounded in 2004). The club has spent most of its history in Serie A, where it currently plays its 2017–18 season. 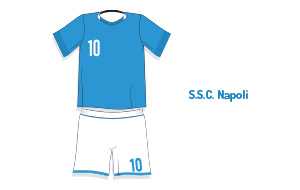 Napoli has won Serie A twice, in 1986–87 and 1989–90. They have also won the Italian Cup three times and the Italian Super Cup, and on the European stage have won the UEFA Cup in 1988–89. Napoli is also the most successful club in Southern Italy and the fourth most supported football club in Italy. 1st4 Football Tickets can provide you with Napoli tickets to home and away Napoli matches. We can provide you with all top Napoli matches including Napoli v Juventus tickets, Napoli v Inter Milan tickets and Napoli v AC Milan tickets.